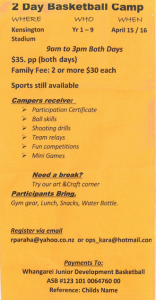 We have a couple of events happening during the holidays. Tomorrow, Saturday the 12th of April the Hikurangi Under 11’s Rugby team will play East Coast Bays here at Whananaki School. Kick off is at 2.00pm, come down and support Cordell, Jazinta, Mason, Logan, Lachie, Teina and lots of players from Hikurangi. 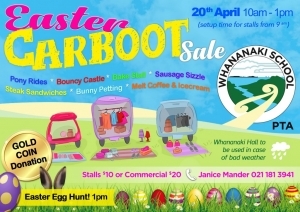 On Saturday the 20th of April, we will hold the Easter Carboot Sale. Please come down and support this awesome fundraiser! Donations of home baking or Easter Eggs will be greatly accepted on the day. 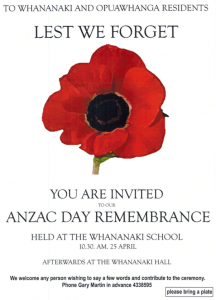 On Thursday 25th April at 10.30am we will hold the ANZAC service here at Whananaki School. Some children are practicing poems to say for the service. I will be holding a practice for the children on Tuesday the 23rd at 10.30am. If your child would like to say a poem and you can practice with them please let me know. They can recite a poem or make one up. It can be about ANZAC day, remembering, unity, hope etc. For more information give me a call. On Sunday the 28th of April we are having a Working Bee starting at 9.00am. If you can’t make this day please have a look at the job list and come on down when you can. Mould remover on decking and playground (including roof of playground). Pressure wash school, playground and decking. Ruma Tahi blind to be installed. New smoke detectors to be installed in school. 2 Red hibiscus to be planted along driveway. Clean Fans and top ledges of windows in classrooms. Measure schoolhouse windows for blinds. Check for nails sticking out. Copyright © 2017 Whananaki School. All rights Reserved.